And now there are snaps to prove it. I guess it wasn’t going to be a huge surprise that these two were going to look adorable together — Shin Mina? She manages to project adorable in anything — even that fat suit she wore for Oh, My Venus! Lee Je Hoon? Well, he’s been in so many serious roles, you think he doesn’t have adorable in him — that is unless you saw his short movie, Just Friends where he rivals Shin Mina in cheek-pinching cuteness. The two of them together? I’m not sure the screen is ready for this sort of overload. Although I wish I wanted to watch the show more. Here’s the thing. When the casting news came out, of course I was excited. I was excited when Lee Min Ki was attached, I was over joyed when Lee Ji Hoon hitched up to it. This excitement was all on the basis of who was being cast, but now that more actual plot information is out? Eh. I find my interest waning. 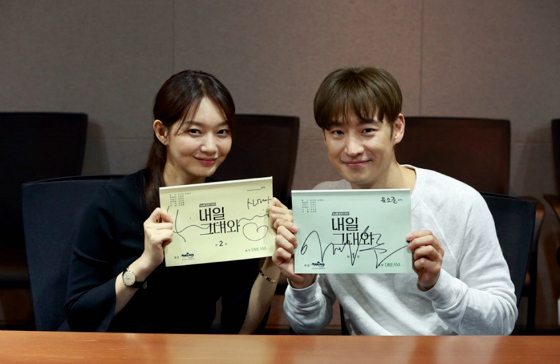 Though something tells me I’ll still manage to choke it down, it is Lee Ji Hoon in a romantic comedy. Before all we knew was the drama was about a married couple and the husband who had the ability to time travel. With that little amount of information, I was able to build my own drama in my head. Now, we have actual plot information which goes something like this: Man who time travels using the subway (wouldn’t that be handy for my commute) learns during a time jump he has an unhappy life in the future. Solution? Marry someone he doesn’t love! Sure. That sounds not problematic at all. Woman is an ex-child star who is unsuccessful as an adult. After they marry husband finds reasons to fall in love with the wife. Hmmm… I guess it doesn’t sound terrible. It just didn’t sound as cool as I imagined it would. Bummer — but that’s on me. The lure Lee Ji Hoon though, that lure is strong and the show is just cute enough to keep me in. So I think I will not only give it a try but will probably finish it up once I’m in there. Also, now that I think about it, learning more about the premise, I can see why they hired Lee Ji Hoon. With his versatile acting talent, he can pull off cranky time traveler who probably has a more serious bent, and he can pull off the cute comedy who does get a romantic storyline.